Marijuana's mainstream enough at this point that a large swath of Americans are familiar with smoking and vaping. Edibles are a little more mysterious, because they've traditionally been very unreliable and far less common, but medical and recreational dispensaries have made them far more accessible -- and really, everyone's at least heard of pot brownies. But what the hell is this "dabbing" stuff? One of the newest and most misunderstood methods of marijuana consumption, dabbing wax is still somewhat controversial -- which is why we've created this guide for the totally clueless, explaining the ins and outs of using concentrated cannabis. Simply put, dabbing is a method of consuming concentrated cannabis oil by dropping a small amount on a hot surface and allowing it to vaporize. While putting hash oil on a bowl or in a joint isn't exactly new, dabbing allows the user to get nothing but the hash oil’s potent effect and flavor. 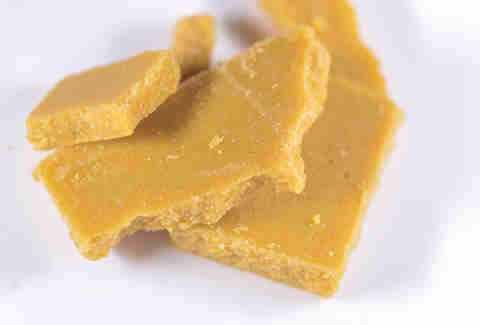 The first step in this process is the creation of the cannabis concentrate. This is achieved by extracting the essential oils of the cannabis plant (stored in the plant’s trichomes, pictured above), usually either with a chemical solvent such as butane, CO2, or propane, or through mechanical means such as filtration screens. Concentrate takes many forms and has many names, depending on the method used and final texture: wax, shatter, live resin, bubble hash, rosin, keef, and the list goes on... The point is, these products are very pure, containing between 50% and 95% THC depending upon the type of extraction and the skill level of the extractor. When this concentrate, which is free of plant matter, is put onto a hot surface, it bubbles away, creating a flavorful and potent vapor which can then be sucked through a glass pipe that looks and functions much like a traditional bong. Like a bong, but not a bong? 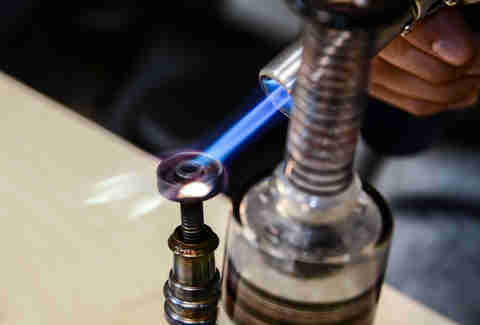 The most common method of dabbing uses a glass pipe, often called a “dab rig.” A proper dab setup consists of a few pieces: the rig itself, the nail (that’s the metal or quartz piece attached to the rig that is actually heated up), the dabber (the dentist-like tool that holds the dab of concentrate), and a crème brûlée-style torch to do the heating. If that sounds like a lot, well, that's because it is... which is why stoners, a proud people whose innate ingenuity would make MacGyver blush, have engineered devices referred to as “e-nails”, which plug into the wall or use a battery to keep the nail at a consistent temperature, allowing for customizable flavor and vapor thickness. This is the wave of the future, ladies and gentlemen! In a chemical sense, well-made dabs are cleaner than traditional cannabis because they're free of plant matter (and the carcinogens that can come from smoking said plant matter). A poorly-made concentrate can come with its own set of issues, however, such as residual solvent, mold, and concentrated pesticides from the plants it was made from. The main issue with dabs is that lots of people make them at home -- not only is this dangerous for them (if they're using flammable solvents), it's also sketchy and unreliable for the user. If you’re lucky enough to have a good source, though, dabs are an amazing shortcut to getting where you want to be; instead of spending 10-15 minutes smoking a joint of a bowl, you can take a single dab and go on with your day. Also, from a purely practical standpoint, dab vapor doesn’t stink like regular smoke, so it is a little more discreet in general... and that goes for concentrates in vape pens, as well. While dabs ideally are a cleaner, more flavorful alternative to smoking flower, they're also very strong and can take some users by surprise. Normally, the worst thing that happens is you'll get the spins (or take an unwanted nap), but if you're dabbing for the first time, it's advisable to take a very tiny amount at the lowest temperature possible -- NEVER dab while the surface is still red-hot, or you’ll be hacking up a lung for sure. Novice users who want to dip their toe into the dab pool should probably start with a vape pen to get used to concentrates in general, and then work themselves up to dabbing. Bottom line is, you should probably only dab if you: A) are looking for something with a higher level of potency, flavor, and medical effect than traditional weed, but a more immediate and reliable effect than edibles, and B) have a consistent and verified source of quality concentrate.